The post mutation landscape is one hell of a place, alright. A wide open world, filled with all sorts of folk. Death is pretty much certain, and if it isn’t from violence, it’s from losing all hope in a world where old Homo Sap has been replaced by Homo Instert-Here-As-Many-Times-As-Necessary. The contour lines are a nice touch, visually speaking, and I like the clarity. 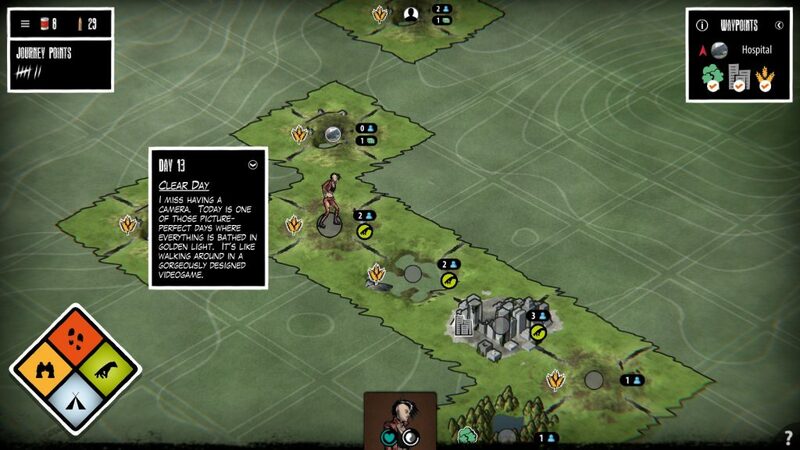 Welcome to Posthuman: Sanctuary, a not-quite adaptation of the survival board game of the same name. 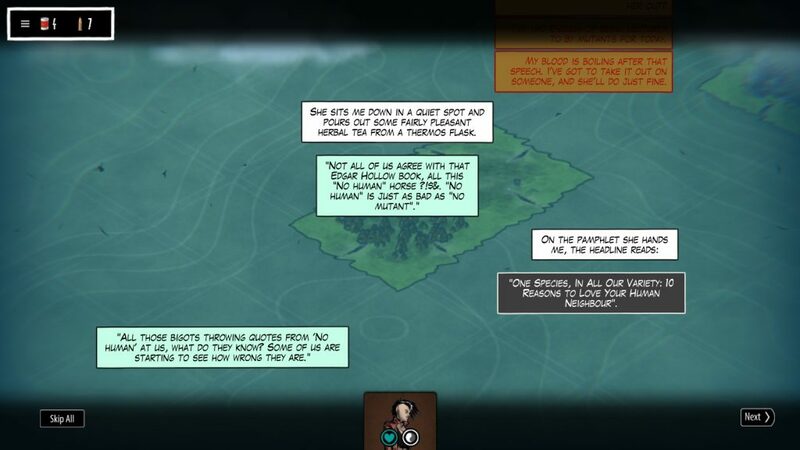 Although, at the present stage, the major shift from the board game, a story mode, is not available. Still, there’s survival mode, and, right now? That’s a fairly replayable doozy, with a few quibbles. The overall idea is that you’re trying to get to three specific waypoints on the map, eventually reaching the fabled Sanctuary. 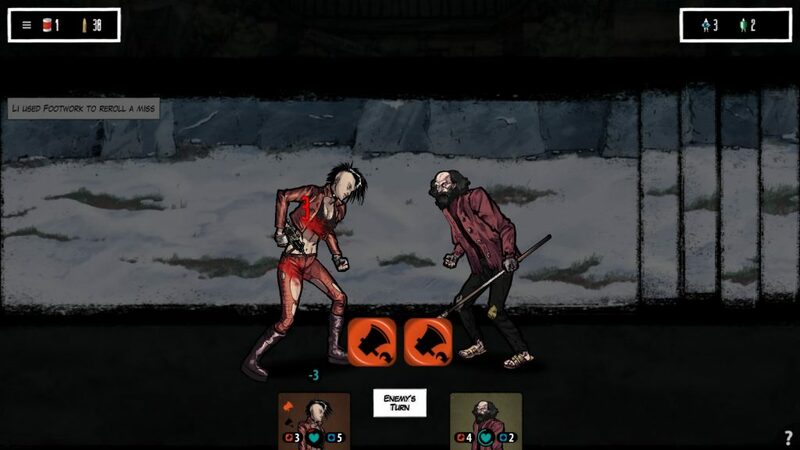 However, to get there, not only do you have to unlock those waypoints by visiting certain tile types (Forests, Mountains, Rural Areas, and Cities) in a specific order before you get to them, you have to deal with hunger, morale, the loyalty of any fellow survivors you meet along the way, mutants… And the possibility you’ll mutate yourself (At which point you’ll no longer be welcome in this strictly human sanctuary.) Not having had the foresight to scan the surroundings yourself (and with Google Maps long gone), you don’t actually know much of what’s beyond your safezone, beyond the existence of the waypoints, and certain survivors. Add in weather, the fact you take one action a day (out of Scouting, Moving, Foraging, and Camping), and it costs food per day, combat, and events, and… Well, good luck! A fine example: Karl Marx murdered me just a turn or two after this picture. Turns out the Kommune are badasses. Aesthetically, the game is currently fairly good visually, with a clear, comic like style, and musically alright, with tracks that aren’t intrusive, but fit their mood quite well. The UI’s pretty clear, although it must be said that it would be nice, certainly, to know how many survival points I have to my next character unlock. It would also be a good time to point out that hitting the options at the start, minimalist as they currently are, would be a good idea due to the simple virtue of noticing that there are R Rated events, and turning them off if you don’t like that idea. They may well be on the level of “I slept with this person, and it felt good” , but I can understand that’s not for everyone, and the game has enough to deal with as it is. Funnily enough, post apocalyptic settings are not nice places to be, so I’ve dealt with lynch mobs, cannibals, mutant haters and human haters alike, and a bundle of other not nice folks. Apart from that, and my other niggle that once you select an event, you can’t seem to unselect it (which has been rather trying when I misclicked) , the game, honestly, feels alright at the present stage. Combat is easy to understand, the board portion is easy to understand, and I haven’t felt dicked over any more than I would expect in a board game, in a post apocalyptic setting, where life is kinda rough. It’s nice to see a clear UI, and explanations of events easily accessible, the events are interesting, the world seems interesting, and I look forward to seeing more. On the one hand, shades of grey, fairly nice. On the other, it’s basically Mutants/Humans right now, which… Well, that’s an approach that has its issues. 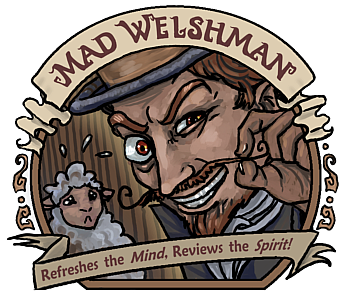 The Mad Welshman would probably be a bad survivor. An okay tyrant, sure… But a bad survivor.